Product information "Organic Virgin Coconut Oil, cold-pressed 250ml"
Coconut Oil is a healthy, flavorful alternative to butter and margarine! Our tasty and full-bodied coconut oil is being produced in our home-based oil mill. After the gentle cold press we let our oil rest, so that the suspended particles can settle. This gentle treatment ensures that the typical taste and the natural scent of the cocount is conserved. During summer time coconut oil becomes liquid ( starting with temperatures above 25 °C) and during winter it becomes hard- this is why it is often called coconut fat! 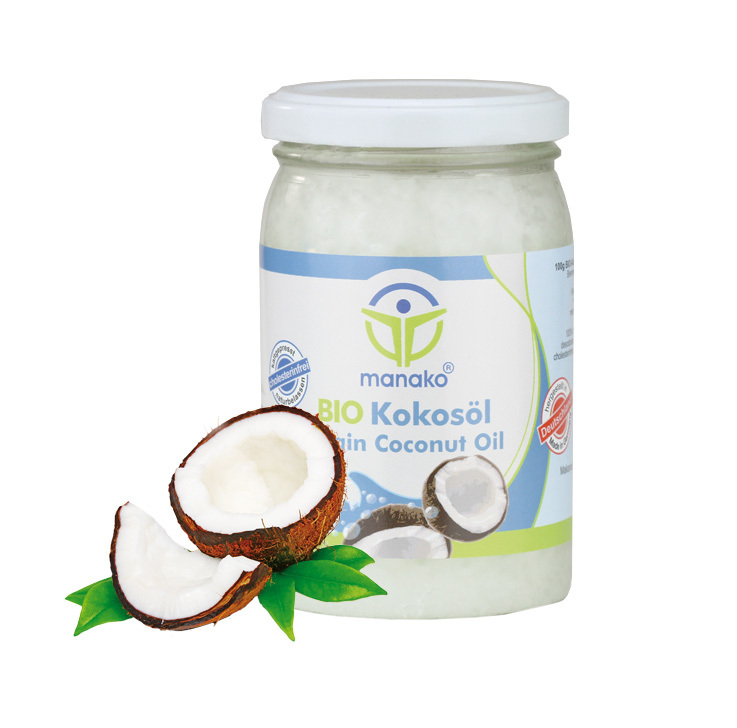 Manako ® coconut oil is a natural vegetable fat, has a delicate taste of coconut and is extremely versatile in the modern kitchen. The mild smell and aroma will inspire and delight you. Coconut oil is perfectly suited to fry and bake with. Mixed with spices and herbs it can be a tasty spread. Besides the positive nutritional value this coconut oil is also to be used for relaxing, exotic-scented massages or as skin and hair oil. Coconut oil does not contain cholesterol. The uniqueness of coconut oil: Unrivaled and fresh cocount taste, unbleached, intense white colour, cold pressed with great care, made without genetic engineering, certified 100% organic, chemical-free, unrefined, nonfermented, non-hardened, non-deodorised / flavoured. First cold press manufactured in the home-based oil mill from Makana. The analytical values are subject to fluctuations as common in natural products.